If you are on a lookout for complete bliss, a trip to Namchi, any day will be the best bet. Featuring a healthy climate almost throughout the year, this spot has countless tourists visiting this destination a lot often. Summer season is the perfect time to journey across this captivating location, as the weather remains a lot pleasant during this time. The months of March to May also serve as a great time to visit Namchi as these months feature moderate temperatures. September to November is again a good time for a fulfilling journey to Namchi. February and October are also ideal as both these months host the very popular flower show festival and the Namchi Mahostav, which turns Namchi into a lively hub. Summers in Namchi begin in March and end in the month of June. During this season the temperature hovers between 4°c - 12°c. Summer season is quite pleasant in Namchi and is the best for enjoying sightseeing and outdoor activities. During this time, the temperature can shoot up to 28° C, making the weather pretty warm yet bearable. 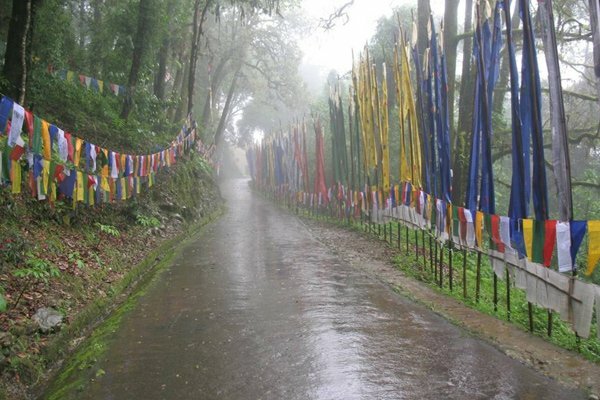 Starting from July and stretching till September, the small town of Namchi experiences the Monsoon season. This season witnesses heavy showers, washing the entire town. Temperature during this season ranges between 5°c - 13°c.Travelers might have to face difficulties, while journeying across Namchi in the monsoons as the frequent rains disrupt outdoor activities. The months starting from October to March witness the winter season. In this season, the weather in Namchi becomes a lot chilly with temperatures hovering between 8°c - -15°c. Visitors who wish to explore Namchi during this time are advised to carry heavy wollen clothes, which are a must during this season.